Weighing in at a mere 6 oz, the Micro-Make™ Powered Sander / Filer is a time-saving tool which puts an end to hard-to-reach work areas and straining hands from finishing your projects. Designed as an ergonomic detail tool, its 360 degree pivoting head provides just the right angle for each user's preference and comfort while providing the rapid 5 mm (3/16") sanding/filing action, (Max. 2000 strokes / min), required for the project at hand. Includes 6 different heads that snap onto the ball-joint mandrel at the end of the tool: 7/16" and 11/16" circular, 3/4" and 1/2" triangular, 5/8" square and 3/16" x 1" rectangular, plus 1 sheet of 120 grit sandpaper you trim to size for each sanding head. 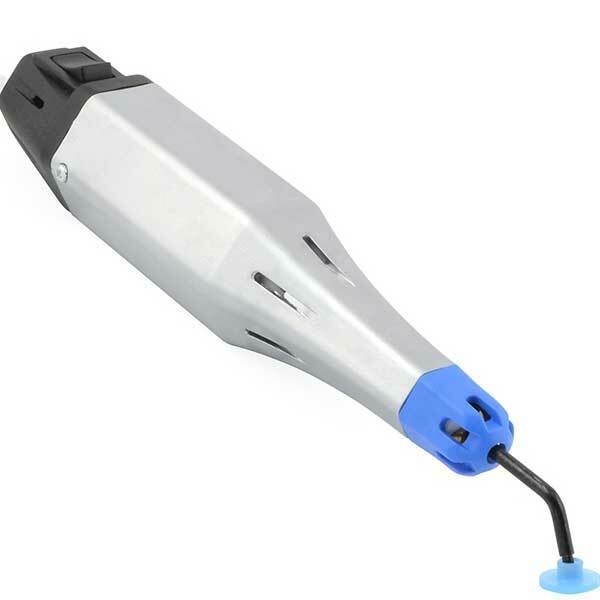 Doubling the fun, the tool also accepts smooth file shanks up to 1/8" diameter to a depth of 1-1/2". See our #86845 Accessory Pack of spare heads and sandpaper which now comes with a Hook-and-Loop Sandpaper System that saves time and sandpaper.